(Bloomberg) -- For once in his long public life as a self-described dirty trickster and political provocateur, Roger Stone had almost nothing to say. 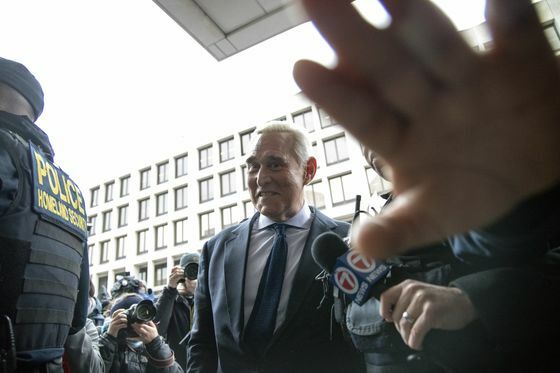 In a Washington courtroom Tuesday, facing charges of witness tampering, lying to Congress and obstructing an investigation into Russian interference with the 2016 U.S. presidential election, Stone was uncharacteristically silent for most of a short hearing before U.S. Magistrate Judge Deborah Robinson. The longtime friend and confidant of President Donald Trump, who was arrested Jan. 25 at his Florida home, entered the courtroom in a navy suit, light blue dress shirt and matching navy neck tie eight minutes before the hearing was expected to begin, silencing the crowded space. Upon taking a seat between two of his lawyers, he repeatedly clenched his jaw and exchanged few words while waiting for the judge to take the bench. Stone said in court that he understood he’s required to appear for the next hearing -- and said nothing more. His lawyer entered a plea of not guilty on his behalf. Robinson scheduled the next hearing for Feb. 1 before U.S. District Judge Amy Berman Jackson. The brief court appearance was the first in Washington for Stone, 66, since his arrest and indictment last week. Stone showed up later that day before a federal magistrate in Fort Lauderdale, who released him on a $250,000 bond. The case is being handled jointly by Special Counsel Robert Mueller and the U.S. attorney in Washington. The indictment alleges that officials in the Trump campaign took an active interest in information stolen from Democratic National Committee computers and in the emails of Hillary Clinton’s campaign chairman, John Podesta, and when they would be made public by WikiLeaks. Mueller is probing Russian interference in the 2016 election and the Trump campaign’s possible involvement. Stone worked as a campaign official in 2015 and remained in contact after leaving. In June and July 2016, Stone allegedly told some of the president’s senior campaign officials about information in WikiLeaks’ possession that could be damaging to the Clinton campaign. According to the indictment, after WikiLeaks’ July 22, 2016, release of some of the emails stolen from the DNC, "a senior Trump campaign official was directed to contact Stone about any additional releases and what other damaging information" held by WikiLeaks, which is led by Julian Assange. Stone is accused of lying to House intelligence committee members about his communications, through intermediaries, with Assange before the election. He was approached by an array of dozens of reporters, supporters and protesters when leaving the federal courthouse, but didn’t stop to comment. Stone also is accused of lying to the House committee about whether he was still in possession of email and text messages he exchanged with those intermediaries, who are not themselves charged with any crimes. One of those men is author and conspiracy theorist Jerome Corsi, who confirmed he is the unnamed "Person 1" in the indictment. Corsi’s attorney Larry Klayman was present in the courtroom for Stone’s arraignment. The other unnamed intermediary, identified in the filing only as "Person 2," is radio host Randy Credico, who was subpoenaed to testify before the House committee and later appeared before Mueller’s Washington grand jury. Stone pressured Credico to avoid contradicting his prior committee testimony, either by lying or asserting his Fifth Amendment right against self-incrimination, according to the filing. The case is U.S. v. Stone, 19-cr-18, U.S. District Court, District of Columbia (Washington).